This article deals with an issue close to the hearts of many who live, cottage or travel along the Rideau; the integrity of its visual setting. Parks Canada is embarking on a large project to define and protect the “visual values” of the Rideau. The project is being run by Pam Buell, Communications Manager, and Heather Thomson, Heritage Planner for the Rideau Canal. Top: Cottages (2 in this photo) blend into the natural settling. Bottom: Suburban style development, no natural setting remains. The project was started a couple of years ago after the Rideau was evaluated by UNESCO as part of the World Heritage Site nomination process. The technical evaluation found that the Rideau had good legislative protection for its environmental values (water quality, wildlife habitat, etc.) but lacked protection for its visual values. The first public meeting on the topic was held on April 2, 2009 with an invited group of over 100 representatives from first nations, federal and provincial agencies, municipalities, NGOs, property owners and business owners. The scope of the meeting was broader than just the visual values issue and a rather large laundry list of issues affecting the Rideau Canal was brought forward and discussed by the participants. Parks Canada's job now is to develop an action plan dealing with the visual values issue. Starting this summer we should expect to see more opportunities for public participation and definitive work toward the goal of protecting the Canal's visual values. To find out more about this project, come out to our Annual Spring Meeting in Merrickville on Saturday, May 9, 2009. Our featured speaker will be Heather Thomson who will provide us with the details of how Parks Canada is moving forward with the project and answer any questions you might have about this critical issue for the Rideau Canal. Our annual spring meeting will be held on May 9 in Merrickville. It will be at the Royal Canadian Legion (same place as last year) - you’ll find a map on the back page showing the exact location. We are very pleased to feature a talk by Heather Thomson, the Heritage Planner for the Rideau Canal. Heather is actively involved in the Rideau Corridor Landscape Strategy, one of the most significant initiatives taken on by Parks Canada regarding the Rideau Canal. As usual, we’ll keep the business portion of the meeting short, giving you ample time to enjoy Heather’s presentation and meet and greet other like-minded Friends of the Rideau. On the heels of last year’s popular post-meeting walking tour, we’re working on setting up another (plans still to be finalized). Come out and meet some Friends. We’d like to thank everyone who filled out our social activity survey distributed with the last newsletter. Our Social Activity Chair has been busy processing, collating and ranking the results and we can now announce the winners. The top choice was a guided boat tour on the Rideau Canal. A close second was the category of Active Recreation, with a preference for guided nature walks and a picnic. Now that we know your preferences, we’ll move ahead with investigating how we can actually do such an event. We appreciate everyone’s input and we’ll let you know as soon as we get something planned. On March 25, Friends of the Rideau lost one of our friends, Gordon Cullingham of Ottawa, who died at age 85. After a distinguished career at the CBC, Gordon became passionately involved with heritage conservation in and around Ottawa. Among his motivations was the belief that heritage structures endow cities with “an atmosphere of handsome self-respect.” To help commemorate the Waterway's 150th anniversary, he and his wife Janet Irwin developed the audio-cassette tour of the Rideau Canal. Gordon tirelessly advanced the cause of conservation and preservation and he will be missed very much. On a personal note, I met and talked with Gord and Janet when I was first starting out with Friends in the mid-1990s. They were unfailingly friendly and supportive, quick to respond to my calls and patient with my questions. We shall not see his like again soon. Heritage Ottawa has created a Gordon Cullingham publications fund in his honour. Boaters, businesses and shoreline residents asked Parks Canada to take action to address unsafe boating activities along the Rideau Canal, particularly excessive speed and environmental effects from wash and wake. As a result the Boating Safely Campaign was launched. On March 31, 2009 representatives from the Canadian Power and Sail Squadrons, Ontario Marine Operators Association, Rideau Valley Conservation Authority, Ottawa Police Service, Rideau Roundtable, Friends of the Rideau and Parks Canada Agency met in Smiths Falls to further discuss and develop the Boating Safely Campaign. An ambitious Communications Plan, incorporating everything from print materials to radio ads, has already been started. An information package has been included in mailings to boaters seeking lockage and mooring permits. Other items such as posters and brochures will continue to appear over the 2009 navigation season. The message is clear: enjoy the Rideau Canal but please ensure others are able to enjoy the waters to their fullest as well. Education is another key component (tied to communication). Posters and information panels are being prepared. Radio and newspaper bulletins have been scheduled throughout the navigation season. Park Canada employee training sessions are being initiated about how to educate the public on this issue. Workshops will be scheduled for developers and realtors to discuss the need for natural shorelines and stabilization options. Signage is being reviewed. An inventory of existing speed and no wake signage has been completed, locations for additional signs have been identified and new signs have been fabricated. Parks Canada crews will be installing these new signs this summer. The new signs include a pictograph for speed and no wake and an explanation of what they mean and will be posted on lock gates at key entry points to the canal. Enforcement of the rules is vital and Parks Canada has met several times with the OPP and Ottawa Police who are directly responsible for enforcement of the speed zones. They are supportive of the campaign and Parks has their commitment to include Rideau Canal wake and speed issues in their spring training (not just marine patrol but land-based as well). The effect of the communication, education and signage programs will be evaluated to see if additional or different types of enforcement will be required in the future. Research is an important component to determine the impacts of wash and wake on shorelines and wildlife habitat (i.e. loon nests). Parks Canada is reviewing the Rideau Valley Conservation Authority’s shoreline evaluations done in 2002-2004, in the area from Smiths Falls to Ottawa. Additional research will be done this summer to evaluate erosional damage and to identify particularly sensitive areas along the Rideau in terms of both erosion and wildlife habitat. In addition to all the above, various sections of the Rideau Canal will be reviewed in detail this year to assess the need for additional speed zones. For more info regarding the Boating Safely Campaign e-mail rideau.comments@pc.gc.ca, fax 613-283-0677 or mail to Parks Canada, Rideau Canal Office, 34 Beckwith Street South, Smiths Falls ON K7A 2A8. A reminder that ALL operators of a pleasure craft fitted with a motor and used for recreational purposes will need to have a “Pleasure Craft Operator’s Card” (or equivalent) by September 15 of this year (2009). 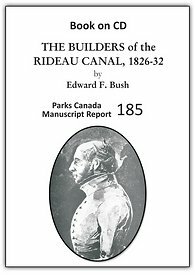 Our “Resources for the Rideau” project is roaring ahead at full speed with the (near) completion of a third Parks Canada manuscript report– this one titled “The Builders of the Rideau Canal, 1826-32” by Edward F. Bush, 1976. Our thanks to Cheryl Gulseth for a yeoman’s (yeoperson’s?) job of pulling together the OCR (text scanning) work on this document, originally started by Katimavik students last year under Cheryl’s supervision in the Parks Canada office. The document went through scanner failures, computer hard drive failures and several other catastrophes before the bits and pieces of it could be pulled together into a single document. Bush’s focus in this interesting document is primarily on the Royal Engineers, the Engineering Department, the Sapper and Miners, the contractors and some of the ancillary staff (doctors, the chaplain, the tailor). He does touch on some of the labourers by including some of the works sheets for Philemon Wright & Sons, covering their contract labour from November 1827 to April 1829. This new Book on CD will be available on our website in the next few weeks (including more details such as a full listing of the table of contents). We will also have it available (together with our other books) this summer at the Depot in Merrickville and at the various Rideau events that we will be attending (see separate article about these events). As noted in the last newsletter, this project is being done strictly on a volunteer basis and the documents will be done when they are done. But, recent feedback indicates that we likely see at least two, perhaps three of Larry Turner’s reports come out as books on CD this summer. Turner’s reports that are being worked on include his report on the 1st Tay Canal (very appropriate for the 175th anniversary of the Tay), his (very large) report on the 2nd Tay Canal and his (also very large) report on the evolution of recreational boating on the Rideau Canal. We’re especially pleased to see some of Larry’s reports made available to the general public. Larry, before his untimely death in 1996, was an tireless proponent of the Rideau Canal, including taking an active role with Friends of the Rideau (he served as Chair and was very active in developing publications and laying the groundwork for World Heritage Status for the Rideau Canal). A historian, Larry researched and wrote about many aspects of the Rideau. His many books, such as those about Merrickville and Perth, are well known, but the research reports that he did for Parks Canada are mostly unknown to the public at large (until now). As soon as any Book on CD is completed we will post the information about it on our website. Our Chair, Ed Bebee, has been diligently working away since his last book, Fish Tales, on a brand new book. Tentatively titled The Invisible Army, it will reveal the untold story of the people who have helped operate the Rideau Canal from 1832 to present. Ed could use your help in identifying some of the more recent workers on the canal - see “Ed Needs Your Help” on the next page. We’ll have the book available for sale via our website and at The Depot the instant it comes off the presses. I'm trying to finish up my new book, The Invisible Army. You're all familiar with the story of Lt. Col. By and his band of merry men. The labourers who built the canal are properly, if belatedly, recognized. That leaves one glaring oversight - those men ( and women) who actually made it work for the past 175 years. I've been ploughing through the National Archives and other historical documents looking for the names, stations, and stories of the operating staff with some success. Where are the gaps? Strangely enough, from the late 1940s to the present. Privacy legislation has restricted access to what information may be in the Archives and quite properly Parks Canada isn't releasing it. They have been more than helpful where they can. I'm looking for names, titles ( lockmaster, canalman, bridgemaster, etc. ), station or stations, and, ideally, date appointed and date retired ( or some approximation). I'm also collecting information about the carpenters, masons, blacksmiths, etc., who worked on canal projects. I'm good to 1930, but blank after that. Floating Plant crew members are also needed. Again, I'm fair to about 1950-60, but need information about the people after that. We will be out and about at various events on the Rideau this summer. We invite everyone to come out and say hi. Was Your Rideau Ancestor Fired From His Job? John MacTaggart Dismissed for intemperance on the recommendation of Sir James Kempt. Scott Master mason dismissed for neglect of duty on the recommendation of Lieutenant Pooley. Thomas Burrowes Suspended for impertinence to Captain Victor; reinstated. R. Johnson Suspended for impertinence to Mr. Blair; reinstated. Sterling Dismissed because of poor script. Martin Hired as temporary office help at 5s. per diem; dismissed for intemperance. Brown Dismissed for ridiculing H.H. Burgess and upsetting office routine. Foy Employed briefly in office; not suitable. Taylor Employed briefly in office; not suitable. A. Burnett Son of the civil engineer who died on the Lachine Canal; brother of a deceased overseer; reinstated because of his destitute condition and good behaviour under Lieutenant Briscoe at Kingston Mills.